Philadelphia, PA – July 14, 2016 – Janney Montgomery Scott LLC (“Janney”), a leading full- service wealth management, financial services and investment banking firm headquartered in Philadelphia, Pa., announced the hiring of three financial advisors. 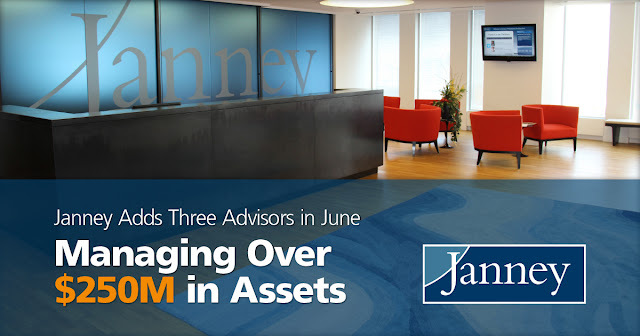 The advisors join Janney with combined client assets under management exceeding $250 million and average production of $816,000. In addition, two Account Executives and one Private Client Assistant joined the firm. Ann Marie Brancato, AAMS®, First Vice President/Wealth Management, joined the Firm on June 20, 2016 in Janney’s Red Bank, NJ office. She was previously affiliated with RBC Wealth Management. Christopher P. Goles, First Vice President/Wealth Management, and the Courtyard Financial Partners team, joined the Firm on June 23, 2016, in Janney’s Baltimore, MD office. They were previously affiliated with Wells Fargo Advisors. Kenneth F. Sarpu, CIMA, Senior Vice President/Investments, and the Sarpu Cardinal Wealth Management Group team, joined the Firm on June 16, 2016, in Janney’s Glastonbury, CT office. They were previously affiliated with Wells Fargo Advisors. With the addition of these three Advisors, Janney has welcomed a total of 23 experienced Financial Advisors to the firm in 2016. Sarpu is also the sixth $1M producer to join Janney in 2016.